Q: How to add links to watermark? I’m working on my photography albums and am running a site about photography. By that means I need to create some demo albums to promote my site. My thought is to convert them to flash flipping albums with watermarks and add my website link to guide readers to. It would be good if I can add links directly to the watermarks. Is that possible and how to do? That’s quite easy to do. 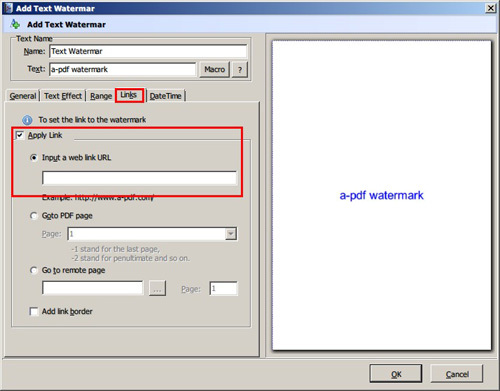 Step1: click “Set Watermark” button under “Add File” tab to open the watermark setting window. Step2: choose “text/image/shape” type of watermarks which links are available. Step3: switch to “Link” tab and check “apply link-> input a web link URL”, and then input your website address in the blank.